In my children&apos;s eyes, there is no place happier than Cowabunga Bay. We took them last summer and they have asked to go back nearly every day since (yes, including all through the winter). Now that it is FINALLY warm enough to go, my children are beyond excited. To them, summer = Cowabunga Bay (not even an exaggeration). 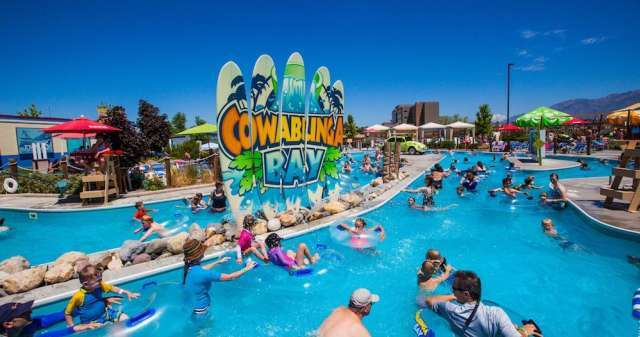 Cowabunga Bay is a Utah&apos;s Newest family water park. Located in Draper, Cowabunga Bay features the World&apos;s Largest Water Play Structure, 6 stories tall, 9 water slides, 300 interactive water toys and 2 giant tipping buckets. There is also a lazy river, beach area and plenty of free parking. Why do my kids love Cowabunga Bay so much? Claire a.k.a. the biggest fan of Cowabunga Bay that ever existed (age 3) says: "Because, I like going swimming and the water slides. I liked the waterslides, the bucket when the people were running away from it, the car on the toothbrush (clarified later as "the car on top of all the waterslides) and throwing beach balls in the water." Tate (age 4.5) says: "The pink little waterslide, the pool, the big waterslides and how daddy helped me go down the big ones." Norah (age 2) loved climbing all over the beach chairs, floating in the tubes in the lazy river, playing with beach balls in the shallow end of the pool and splashing everywhere as much as possible. Why do I, as a mom, love Cowabunga Bay? It&apos;s big enough that there&apos;s plenty to keep everyone entertained, but it&apos;s not so big that I&apos;m anxious the entire time about trying to keep track of everyone. There&apos;s entertainment for the whole family. It&apos;s such a great place for kids of all ages. I felt like it was the best Utah family waterpark we&apos;d ever been to, especially for toddler-age kids. It&apos;s sooo close to our home! We live in the Sandy/Midvale area and always felt like we had to make a day out of going to any of the waterparks that we lived around. However, Cowabunga Bay is close enough to run over for a couple hours after my husband gets home from work, allowing us to be totally spontaneous. They don&apos;t charge extra money for life jackets for the kiddos or tubes to float on - THANK YOU so much!!! The whole waterpark is eye-candy. There&apos;s so much color and fun things to see everywhere. While waiting in line for slides, there&apos;s things for the kids to do, like shoot water guns and dump water buckets. They allow parents to slide down the big waterslides with little kids. This SAVED us. My kids got to fully experience everything at the waterpark by sliding down in my husband&apos;s lap. To read more of Quinn&apos;s writings on life, motherhood, food photography and the pursuit of happiness, check out her blog TheArtisticMom.com.